Some time ago I promised to blog about how to teach statistics with chocolate. Anyone who has watched my youtube videos may have noticed a recurring theme. Helen sells Choconutties. These are a fictitious chocolate bar, originally devised to require a table of prices, which would require the use of absolute and relatives references. As the series developed Helen had all sorts of issues with her sales, which required statistical analysis, often using spreadsheets. For the “choosing the test” video I managed to come up with seven different chocolate-based scenarios. I’ve had complaints from my students that using my materials makes them hungry. 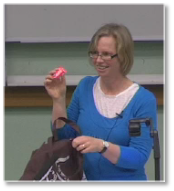 One of my favourite lectures, back when I gave lectures, involved the use of chocolate in teaching about hypothesis testing. Here’s how it goes. 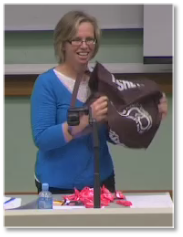 I come into class with a large opaque bag of small chocolate bars. 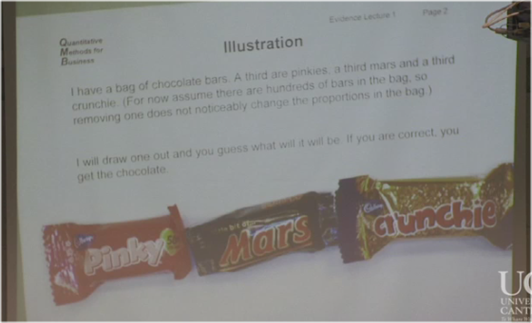 I tell the class : “In my bag I have equal numbers of three types of bar – Pinkies, Crunchies and Mars bars.” I show them an example of each of the bars, placing them on the document camera base. Next I say, “I’m going to draw one bar at random, and if you can guess correctly what it is, you can keep it.” I call for volunteers, and even our normally reticent New Zealand students will join in, if chocolate is involved. So the first one guesses: “Mars”. I draw out a bar – and yes it is a Pinkie. The students laugh and I toss the Pinkie to the student who guessed correctly. I draw out a bar – another Pinkie. There are murmurings in the ranks. Fifth student: “Pinkie” – wins a bar. 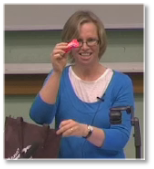 Sixth student: “Pinkie” – you guessed it – they win a Pinkie too. It has become apparent that all is not as it ought to be. I up-end the bag on the front desk and the shiny pink bars pour out. I was not entirely truthful when I told them what was in the bag, as it contained only Pinkies. So then I ask them – when did you get suspicious that the bag was not one-third pinkies? The answer is usually that they get suspicious at three in a row, but their suspicions are confirmed at four Pinkies in a row. So then we look at the probabilities of those occurrences. If the bag really did contain one-third Pinkies, then the probability of getting three pinkies in a row is 1/3 to the power of 3, or 1/27 or 0.037. However the probability of four pinkies in a row is just over 1%. We doubt the initial assumptions when an occurrence of low probability occurs. It was possible that the bag contained what I said it did, but the evidence was against it. From here we move on to the null hypothesis. In this case the null hypothesis is that the proportion of Pinkies is one-third. We took a sample of Pinkies, and found that the likelihood of getting that sample, if the null hypothesis is true, is very small. So then we need to revise our view of the world – or in this case the contents of the bag and the veracity of the lecturer. I have carried on with a second exercise, where the bag contains no Pinkies, but Mars and Crunchies. Obviously it takes longer to suspect that there are no Pinkies. However, the students are more suspicious because the previous experience has taught them not to trust the instructor. My colleague used the same bars in a lecture a few weeks later, with many of the same students, and found they were suspicious of him also. I have found this to be a worthwhile exercise. It is delightful to watch the dawning suspicion and amusement when they find that all is not as it seems. Then as we work through hypothesis testing and other inference I come back time and again to the idea of evidence. How much evidence did we need before we decided that the bag was not one-third Pinkies? We didn’t need to use chocolate, but it certainly makes the lesson memorable. Great Idea! However, we should incorporate the Prior information (1/3 each) and demonstrate Bayesian updating.